After years of lamenting the decline in CD sales, music industry executives might have been popping champagne corks at the latest figures from the Recording Industry Association of America. Revenues from recorded music were up 0.9 per cent to $7bn (£4.9bn) in what the RIAA called “a milestone year for streaming music”. But Cary Sherman, chairman and chief executive of RIAA, said the champagne should remain on ice. Streaming services had accrued 13 million subscribers by the end of December, he noted, but the system has been hijacked by tech giants. “So many of our music community brethren feel that some technology giants have been enriching themselves at the expense of the people who actually create the music,” Mr Sherman said. In 2015, streaming accounted for 34.4 per cent of music industry revenue, after overtaking downloads for the first time. Owning music – in whatever format – is on its way out. Revenue from downloads is down. 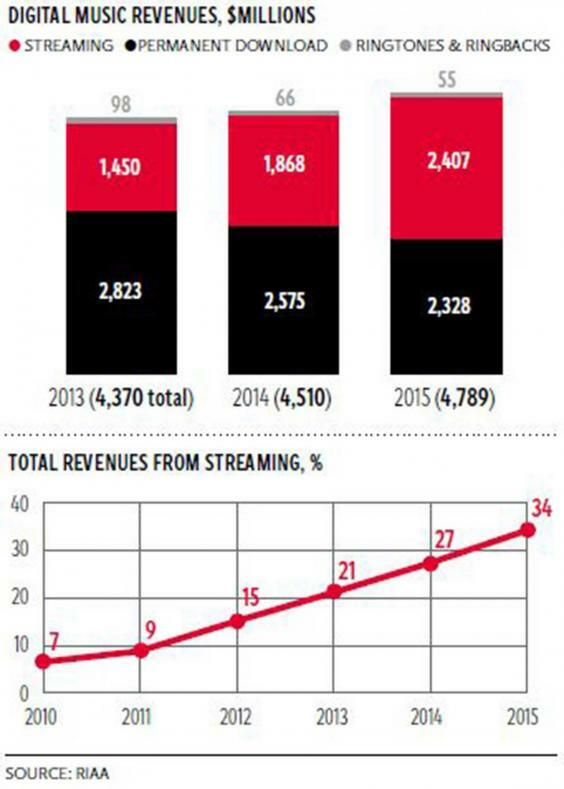 Streaming is starting to pay, but not fast enough, according to those counting the cash. Mr Sherman said that in 2015, fans listened to hundreds of billions of audio and video music streams through on-demand ad-supported digital services such as YouTube. 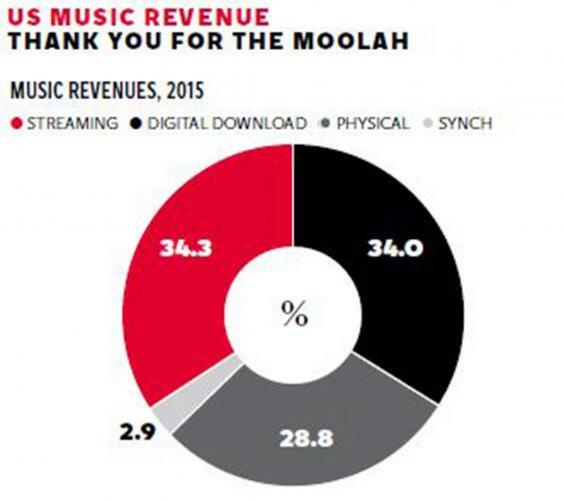 “But revenues from such services have been meagre – far less than other kinds of music services. And the problem is getting worse,” he said. Ad-supported streaming revenue is up 30.6 per cent on 2014, at £385.1m, but that figure only accounts for 16 per cent of total streaming revenue. The majority comes from internet radio royalties and subscription services. Nielsen figures show that video streaming services such as YouTube and Vevo accounted for more than 50 per cent of music streamed in 2015, or more than Spotify, Apple Music, Tidal and Google’s own Play Music combined. Put those two figures together, Mr Sherman contends, and it doesn’t look as though YouTube is paying its fair share. Jon Webster, president of industry trade body MMF, agreed that while tech companies have profited from changes to the way music is consumed, they have also provided the tools for artists and managers to grow their business. “Blaming technology for our woes is not a solution. The recorded music industry needs to work together to solve our internal issues, and externally to finding better modes of working with technology,” he said. Those solutions are already emerging, according to James Sandom, who manages bands including Belle & Sebastian, Interpol and Kaiser Chiefs. YouTube says it’s at the forefront of this evolution. It contends that it provides a promotional platform for artists and labels who want to reach an audience of a billion users. It’s also launched a copyright system called Content ID that allows copyright holders to identify and monetise copies of their work. But as long as YouTube remains the go-to platform for music streaming, paid-for subscriptions like the one offered by Spotify, who declined to comment for this article, are going to be a harder sell to the listener. YouTube will continue to benefit. It was valued at $80bn by a Bank of America Merrill Lynch analyst last year – more than Starbucks, Yahoo and eBay combined. The music industry made more money out of vinyl sales than it did from ad-supported streaming from services such as YouTube in 2015. Now streaming is starting to pay, YouTube may find itself under increasing pressure to give more money to the makers and the owners of the music it hosts.